This Kitty cake was my very first fondant experiment. It was a strawberry cake baked in the Wilton Ball pan. I lightly iced the cake with royal icing, colored fondant lavander and rolled out strings. I used the fondant strings to wrap the cake in different directions. 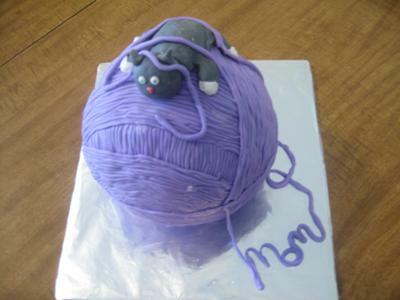 I made a kitten out of grey colored fondant, and placed it on top of the yarnball. The kittens eyes are cupcake sprinkles. That is just tooooooo cute! Excellent job on all of it!!!!! !